With a long-standing commitment to quality and craftsmanship, Norman shutters have been considered one of the world’s best-selling interior shutters. Custom and handcrafted with the highest quality and FSC certified wood and wood-composite, and offering the #1 warranty in the industry, Norman shutters are the perfect investment. Norman’s wooden shutters were created to last a lifetime and are custom designed for those who demand the best. Their hardwood shutters include Normandy® and Sussex® Shutters which are custom made and handcrafted specific to each windows style, shape, and needs. The use of FSC Certified wood insures that each shutter is eco-friendly and was created with sustainably sourced materials. 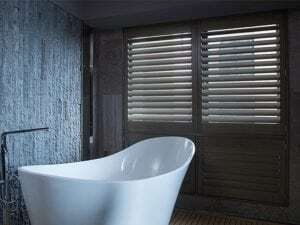 Normans wood-composite shutters are a “greener” solution in planation shutters. Known as the “Eco-Smart” engineered wood shutter, their wood-composite interior shutters have a solid MDF core – a core made of real wood in its advanced state – which offers incredible density and strength, and utilizes 95% of the tree, leaving less waste. For enhanced durability, a polypropylene coating is used to help prevent cracking or chipping on the surface. For more on Norman Shutters, or to schedule your FREE one-site consultation, contact Shades By Design.